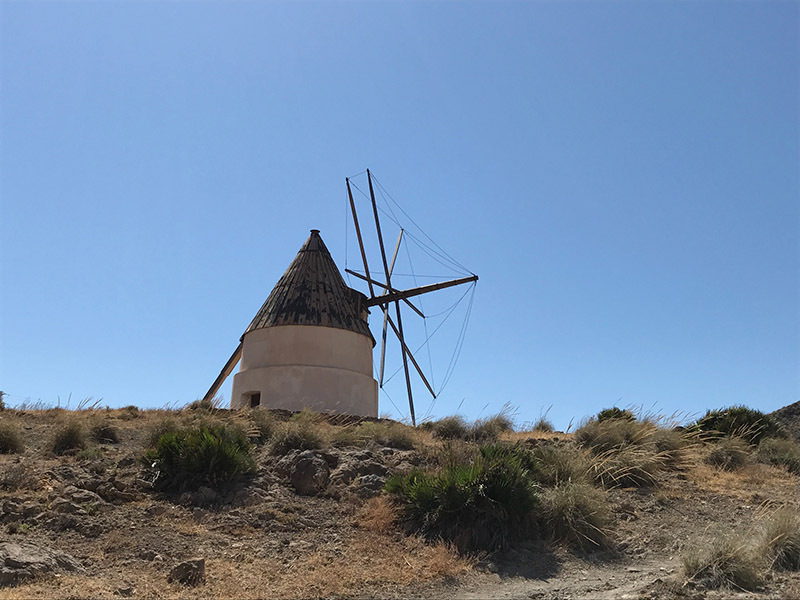 I think we both felt a large tinge of sadness at the thought of leaving the lovely Cortijo la Alberca, and it is not that often that one can say that about a hotel in which only a brief period of time was spent. The place quickly cast a spell. It was truly relaxing and peaceful (apart from the occasional yapping fit had by a couple of small dogs further up the hill who believed that the echo of their barks represented some terrifying daily threat). 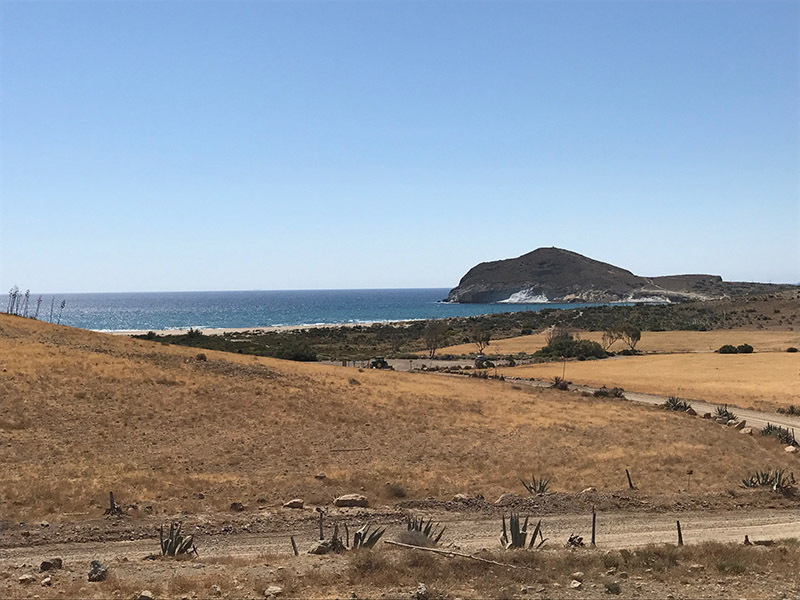 We drove down to San José with a view to walking further along the coast to a couple more beaches, one of which was made famous as a location for the film ‘Indiana Jones and the Last Crusade’. At this stage, I just feel the need to write a little more about the agriculture in these here parts. In a previous post, I mentioned the enormity of the polytunnel presence, and alluded to the obvious contribution that this area makes to Spain’s GDP. However, driving across the Campo de Níjar towards the coast, we had to pass through one of the oldest parts of the polytunnel jungle, and there is a marked contrast between the wealth of the growers and packagers, with their modern-looking new office complexes, and the living quarters of the workers. The workers clearly come from north Africa and Arab countries, presumably because their labour is cheap and they can bear the high temperatures that prevail in these giant cultivators. I read an article recently about this area being Spain’s hidden dirty secret, and it has not been the first such article. There is, as has been written, an uneasy disconnect between the tourist areas, the wealth of the landowners and producers and the immigrant workers living in what appear to be small townships, not much better than those to be found in South Africa. Make-shift accommodation in the middle of the acres of plastic, and workers toil in uncomfortable conditions to earn something to send back to relatives abroad. It has a very different atmosphere here to anywhere else we have visited in Andalucia, and I do hope that exploitation of immigrant workers is not an unmonitored issue here. The track is literally a dirt track, and clearly a route that gets very busy in the height of summer, when the Spanish from the large inland cities all flee to the coast to escape the searing temperatures of August. There are car parking areas at regular intervals, all of which charge a fee during the main holiday months. That said, the coast here is remarkably unspoilt, wild and beautiful and presumably now protected due to the Parque Natural status. We stopped at Playa Barronal, the stretch of sand adjacent to Mónsul, and even though this is a designated naturist beach, it does appear that any secluded beach along the coastlines here is deemed suitable for a shedding of all clothes, but generally sunbathers are discreet and considerate of other beach users. The beach and the crystal clear water here are superb. The sandy sea bed lead out to rocky clusters that provide fabulous opportunities for snorkelling and fish gazing. This is a glorious stretch of coastline in every respect. We have been lucky in that, so far, we have not experienced summer crowds. It will be interesting (or disturbing!) to see how much our own local beaches change with the onset of the holidays proper. Thank goodness we have our own pool…..
After a rest on the beach (life is so hard that frequent rests are obligatory) we tried to continue along the dirt track to the Cabo de Gata lighthouse, only to find that access was blocked. As a result we had to drive the long way round via the Las Salinas salt flats. 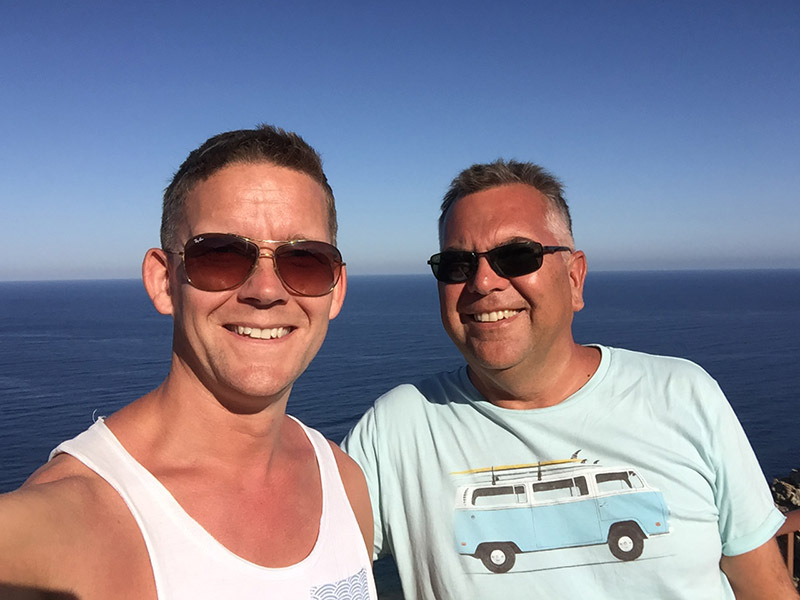 Andrew was very excited at the prospect of seeing flamingoes, as these birds tend to come here in late June and spend the summer months feeding in the brackish waters just inland from the coast. Sure enough, as we drove towards the coast over the flatlands to the west of the Sierra de Cabo de Gata, there were the flamingoes! Not a massive number, but enough to satisfy the immediate appetite. 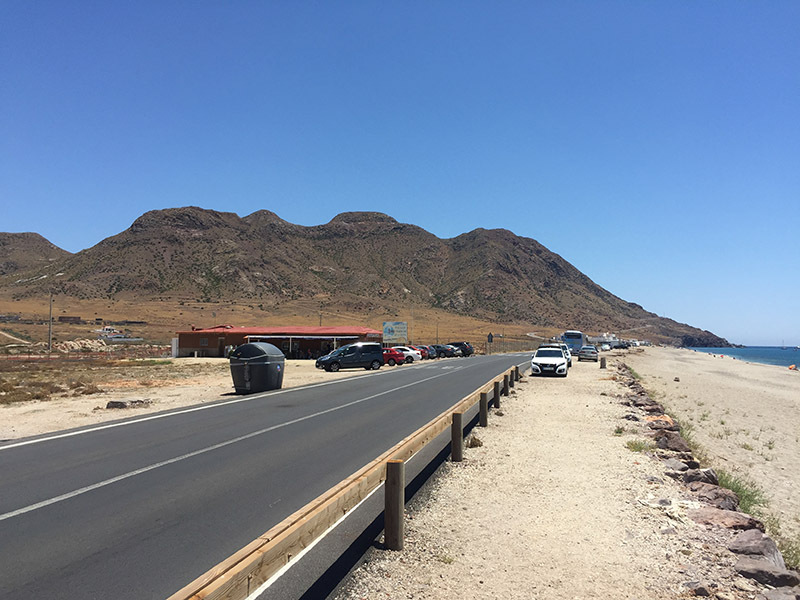 We drove from San Miguel along the strip of land between the sea and the salt lake, beside a long stretch of sandy beach, whipped a little by a brisk wind, stopping briefly for a quick drink at an uninspiring little bar surrounded by scrubland. Good Samaritans that we are, we had to rescue a hire car that had dug itself into the sand. Almost as an afterthought, we decided that we would continue onwards to look at the lighthouse that we had attempted to reach from the other side, and mighty glad we were that we did. The road ends at the lighthouse, and it seemed that very few people bother to drive this far. The coastline around the bluff, on which sits the lighthouse, was spectacular - sharp rocks tumbling down to a turquoise, green and deep blue sea that folded over a reef. It was a glorious spot, made more glorious by the presence of a rather attractive restaurant with a terrace overlooking the coastline, and where we had a rather pleasant light lunch in the company of around 150 flies. The beach below beckoned and, although we had not really planned to spend so much time here, the lure of the sea was too much, and the swimming here was amongst the best we had experienced on this trip. 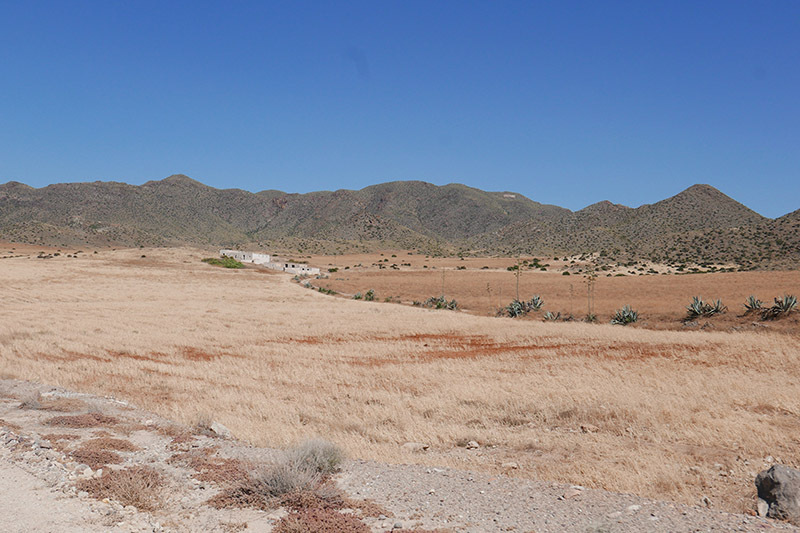 Reluctantly, we packed up the car and set off to Almería city on the last leg of our little expedition. We didn’t have a huge amount of time to explore the city, and this was very much an exploratory trip, but from our initial impressions, the heart of the place has some charm. 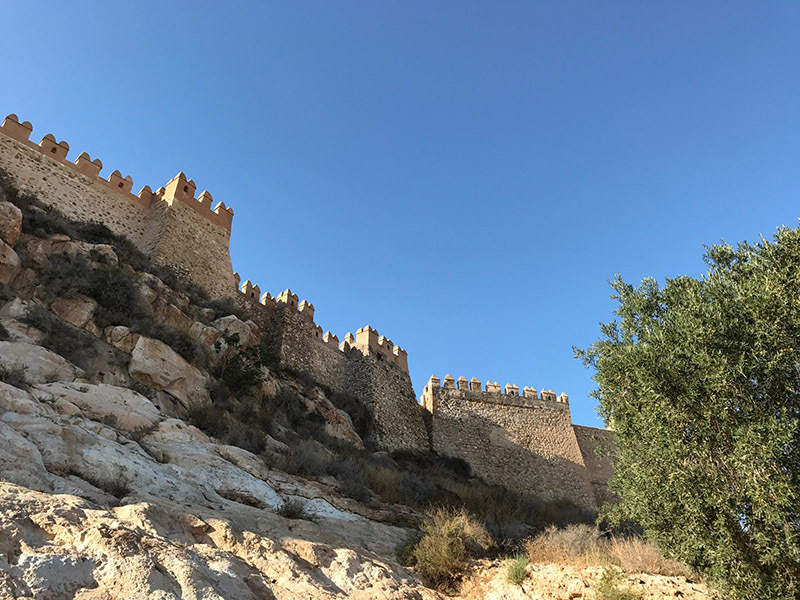 The wide central boulevards rather belie the more decayed areas that surround the cathedral and edge the beautiful Moorish Alcazaba, but I do have the feeling that Almería is on the verge of rediscovering itself, without denying its heritage. TripAdvisor found us a gem of a bar for tapas and a drink. 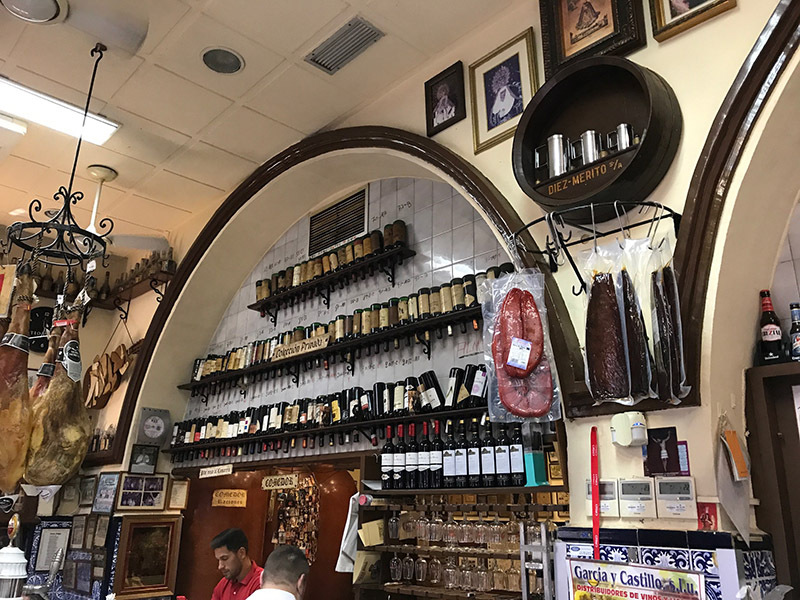 Case Puga, as with so many of the best bars in Andalucian towns, looks absolutely nothing from the outside, but inside it is a veritable shrine of history, good wines and good tapas, all served up with charisma and efficiency. I could thrive quite happily with a bar such as this on my doorstep. Almería is becoming something of a mecca for Tapas Tours, and I can understand why, and I feel sure that this reputation will do nothing but good as the city forges its new future.